Pipeline's executive trio heads a volunteer program of 90 Emory students partnering with 48 South Atlanta high school students. 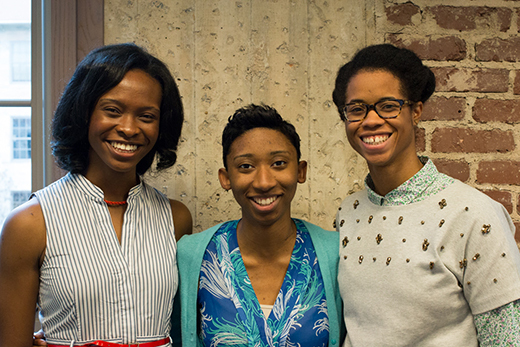 From left, graduating MD/MPH students Diogo Anyigbo, Katrece Outlaw, and Zoe Julian. Learn more about the Pipeline Program by attending the Annual Closing Ceremony. • 5 to 7:30 p.m.
For high school students at South Atlanta School of Health and Medical Science, the Emory University Pipeline Program can also be a lifeline, connecting them to mentoring, future job opportunities, and better health outcomes for their communities. "Pipeline transforms ideas into reality," says Emory graduate student Diogo Anyigbo, president and an eight-year veteran of the program. "Emory undergraduate and graduate students transform their learning about neurology or infectious disease, for example, into conversations and curricula that inform high school students about better health care for their communities today and greater career opportunities for themselves tomorrow." Equally important, the program's high school students fully engage in the process, according to Anyigbo, who will graduate in May with a doctor of medicine and master of public health (MD/MPH) dual degree. "Our high school students transform their health sciences education into annual final projects, like rap songs and public service announcements, that deliver important health messages to their teenage peers and their communities," she says. The program is an interdisciplinary mentorship and health sciences education initiative connecting high school students at South Atlanta with Emory undergraduate and graduate students. It improves high school students' knowledge of basic science and medical concepts, prepares them for college, and develops leaders who are sensitive to the socio-contextual determinants of health and proficient in mentorship and scientific communication. As the Division of Campus Life's recipient of the "Dean's Definer of the Month" award, the Pipeline Program is one of many volunteer, student-driven initiatives that exemplify "advancing education into action." Campus Life defines advancing education into action, its key concept of the month, as applying classroom learning to one's work and using experiential learning to enhance knowledge acquired in the classroom. Pipeline president Diogo Anyigbo (on right) visits a junior cohort session. Back row from left: Lia Phillips, MD/MPH student and graduate teacher, and Remy Van Sanford, fourth-year medical student and curriculum coordinator. Front row, from left: Destine Henry, South Atlanta high school junior, and Nicole Becker, Emory College junior. Conceived by two Emory medical students and launched in 2007, Pipeline recruits less-privileged sophomore high school students and enrolls them in the program's three-year longitudinal curriculum that extends to high school graduation. In addition to health sciences education, the curriculum includes one-on-one mentoring and preparation for college. The program conducts sessions during fall and spring, some on Emory's main campus and others at South Atlanta high school. 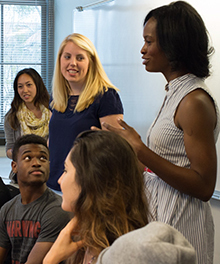 Pipeline serves 48 high school students annually with program staffing of more than 90 Emory student volunteers, including undergraduates serving as mentors and graduate students as teachers, curriculum coordinators, evaluators, ancillary support and senior leadership. High school students are organized in three cohorts that correspond to grade levels. Throughout the school year, each cohort focuses on a different health issue and develops a final project. For example, this year's sophomores are studying infectious disease and sexual health and will produce an educational video. The junior cohort is examining neurology and mental health and writing an educational song. Seniors are exploring public health and community engagement, with a community impact initiative as their final project. "One-hundred percent of our South Atlanta students graduate from high school and 80 percent matriculate to college," says Zoe Julian, Pipeline's vice president for mentorship, adding that Emory student volunteers also benefit greatly from the program. "Pipeline takes Emory students from often more-privileged backgrounds and engages them in building relationships with high school students from generally less-privileged backgrounds." explains Julian, also graduating in May with an MD/MPH dual degree. "The experience benefits our high school students and our Emory students, as well as the communities they will serve throughout their careers. Our motto, 'each one teach one,' highlights this reciprocal nature of the program." With 250 high school and university students completing the program since 2010, one of the challenges is evaluating Pipeline's impact by tracking the progress of its high school student alumni after graduation and eliciting feedback from its Emory student alumni as they move into their career fields, according to Katrece Outlaw, Pipeline's vice president for logistics. "As a student-driven initiative, high volunteer turnover is a given," says Outlaw, who also will graduate in May with an MD/MPH dual degree. "We are able to keep in touch with a few of our former high school students, but we are working to really increase that capability." Meanwhile, Pipeline will continue to do what it has done so well for eight years — advancing education into action by bringing together South Atlanta high school students and Emory University students in partnerships that serve the greater Atlanta community and create opportunities for all program participants to enhance their education, inform their future careers, and expand their capacity to serve others. Pipeline's student leaders invite the Emory community to learn more by attending the program's Annual Closing Ceremony on Wednesday, April 29, 5 to 7:30 p.m., at the School of Medicine. The event celebrates the South Atlanta High School students' hard work and features their final projects.